Disclosure: this post contains affiliate links. If you click on a link on my site and make a purchase, I will receive a small commission which helps to support my blog and related expenses. 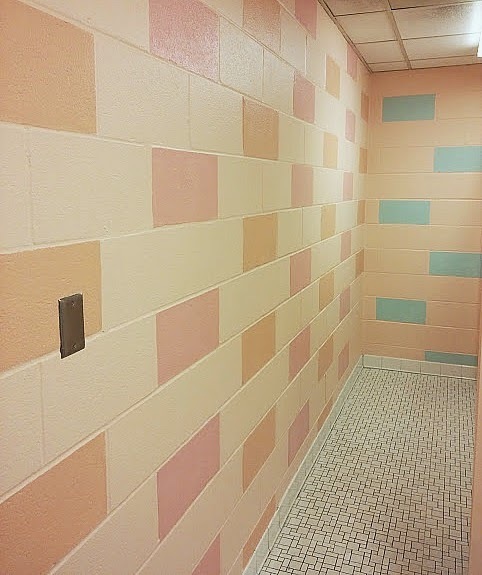 The Contest: we planned this bathroom around the 'Earn Your Stripes' contest put on by Frog Tape....the grand prize of $5000 would be put to good use in updating our youth spaces. 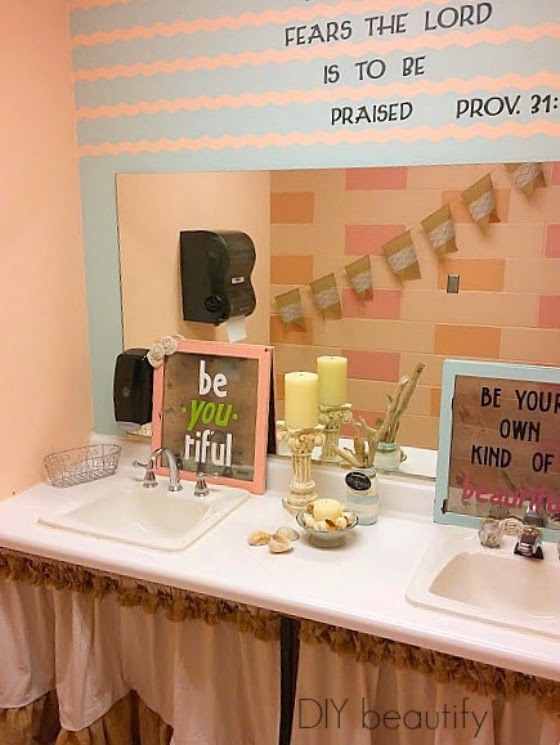 While our husbands and youth group were on a recent trip, we decided to take on the challenge of this ugly bathroom and turn it into something beautiful for our girls. We shopped Goodwill for frames, canvases and anything else we thought might be useful. Yes, we were aiming high! Our church generously had the room repainted in the base color we chose so we wouldn't have to do it. Painting around 3 toilets would have been a real pain! We added accent colors of coral, pink, and aqua. Pink and coral 'stripes' and on the end wall a hit of aqua. Here is the 'new' sink area. We sewed a drop cloth/burlap skirt for under the sink, and painted a chevron pattern above the sink, using aqua. There are several different 'beauty sayings' sprinkled throughout the room, the biggest is this vinyl verse above the sink. The others were all made from frames found at Goodwill that we painted. We used Looking Glass spraypaint by Krylon (affiliate link) on the glass and vinyl for the sayings, cut with a Cricut diecut machine. We wanted to keep it 'fresh' and 'fun' but with a message that outward beauty is not the most important thing! I finished the pictures at home and took a few 'beauty shots' before I took them to the church. The first one is hanging in one of the stalls (didn't think you needed to see a picture of that, lol). The last big project we did was based on this Audrey Hepburn inspired wall art at Dimples and Tangles. Jennifer posted her project just as we were planning ours and we knew we had to incorporate it. We found a gigantic canvas at Goodwill for only $2 so we just modified our art so it's bigger. You can see that we incorporated all our room colors into this piece. 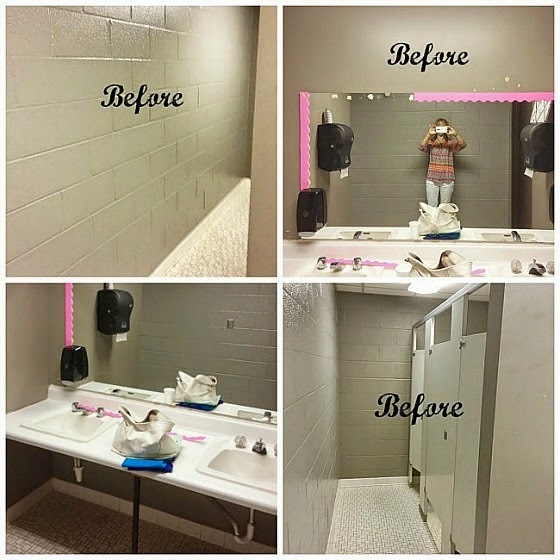 The girls were thrilled with the transformation of their ugly bathroom! They now have a bright and feminine room to use and when they walk in the bathroom they are greeted by cheerful colors and fun artwork, instead of a drab gray space. Sadly, we didn't win the 'Earn Your Stripes' contest by Frog Tape...but we did earn a roll of Frog Tape because our entry was approved! 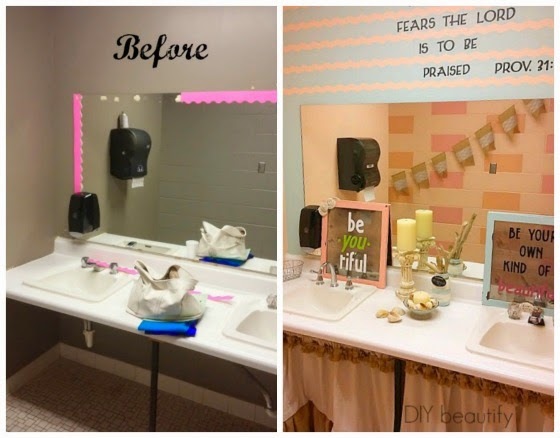 Better yet, we transformed an ugly bathroom into something pretty!! Dare I say 'beautiful' that will be enjoyed by our amazing girls for years to come! 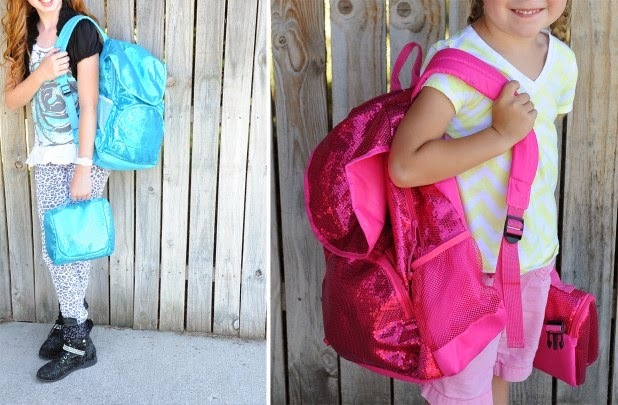 I have to tell you about the Back to School Blowout at GroopDealz. Tons of amazing items for sale at rock bottom prices! If you're looking for unique items at a great price, check out the sale here! 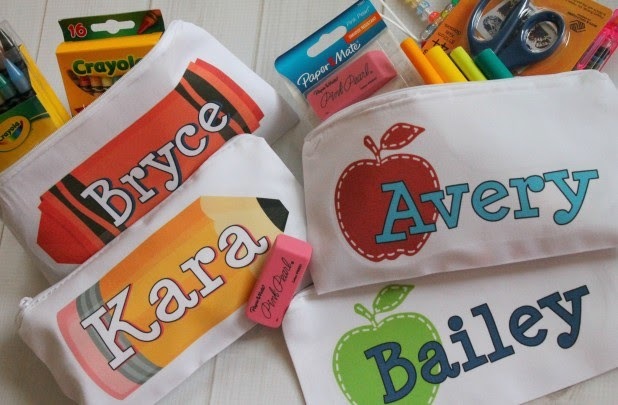 Personalized Pencil Cases for only $5.50! They have a ton more stuff...but you have to shop early for the best selection! Thanks so much Ann! It was a fun project to do and the girls' excitement was totally worth all the work! What a special room for your youth girls! I love all of the verses and quotes you chosen to use...what great reminders for them to see as they "primp!" Thanks so much Jennifer for inspiring our Audrey Hepburn wall art! Fun contest! I love the happy girls are the prettiest sign! This is so cool! I wish all bathrooms looked like this! 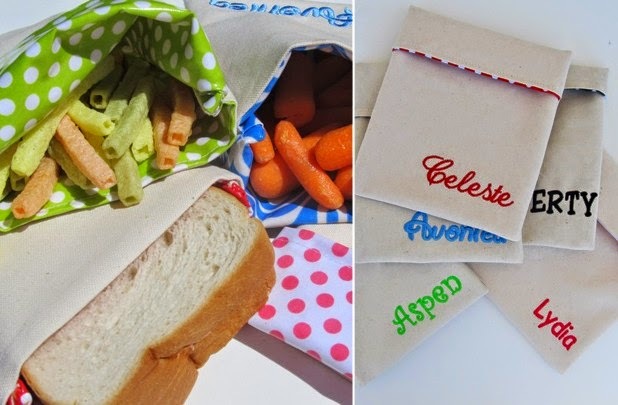 I would be honored if you would come share this at Pin Your Friday Favorite on my blog. Have a great weekend! The wall art is my favorite! Wonderful transformation for a great bunch of young ladies. Thanks for sharing on Show-Licious. Pinning! Thank you so much Ashley, both for the Pin and the sweet comments! Make sure you enter my Giveaway today, in celebration of my one-year Blogiversary! !